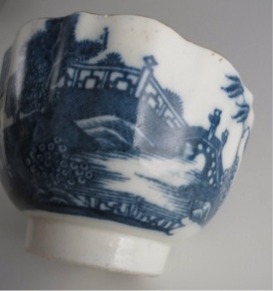 An attractive tea bowl, coffee can and saucer, printed with a delightful blue oriental scene of a pagoda in a charming landscape with houses, trees, a boat and a bridge with two figures crossing it. 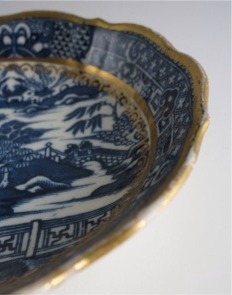 This beautiful tea bowl and saucer was made at the famous Caughley factory, c1785. 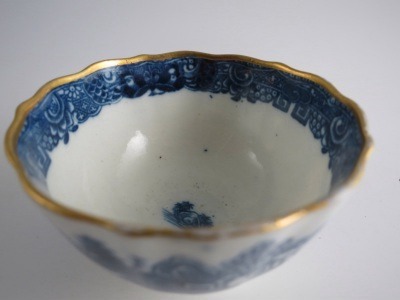 The tea bowl is of a scalloped shape with a scalloped gilded rim and raised upon a circular foot rim. 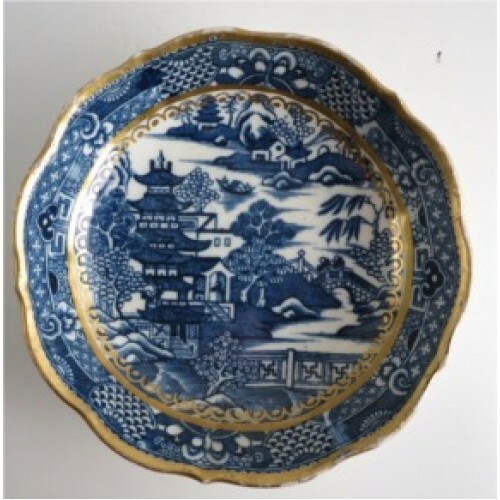 This very pretty tea bowl is beautifully decorated with a blue and white print of an oriental landscape which includes a large pagoda. 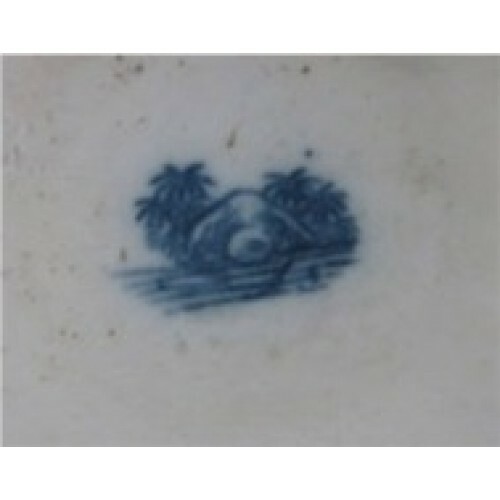 There are islands with houses, rocks and trees. 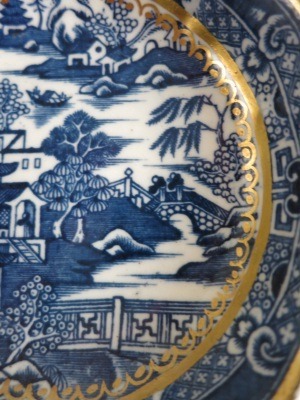 Between the islands sails a boat and there is a delightful oriental bridge crossing over the water. 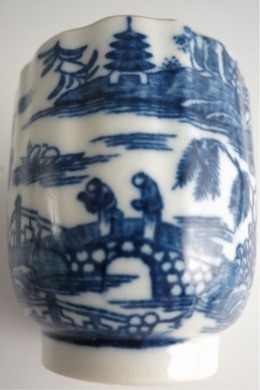 There are two figures to be seen crossing the bridge. 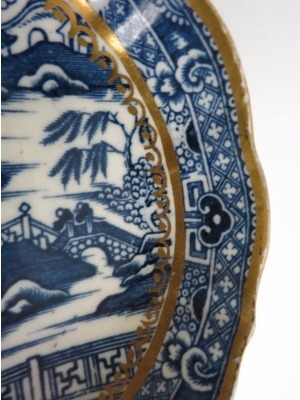 The blue of this decoration is very vivid and rich in appearance. 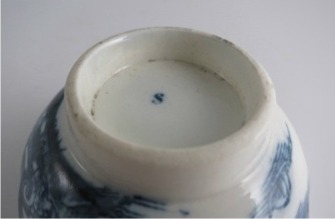 Inside the rim of the tea bowl there is a decorative band of blue decoration. 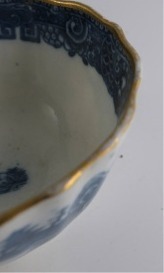 The rim of the tea bowl is gilded. 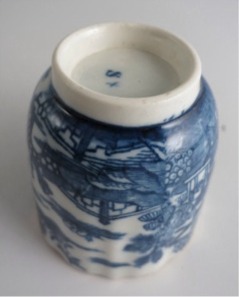 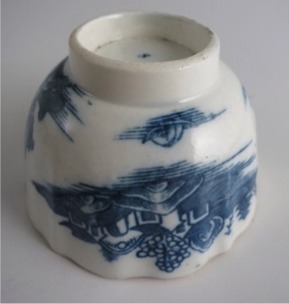 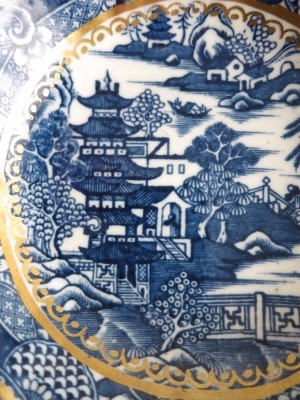 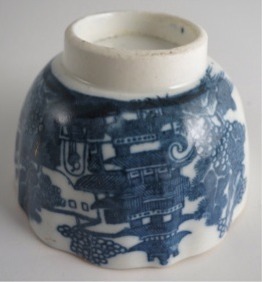 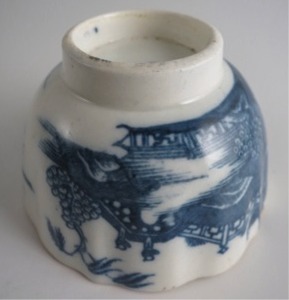 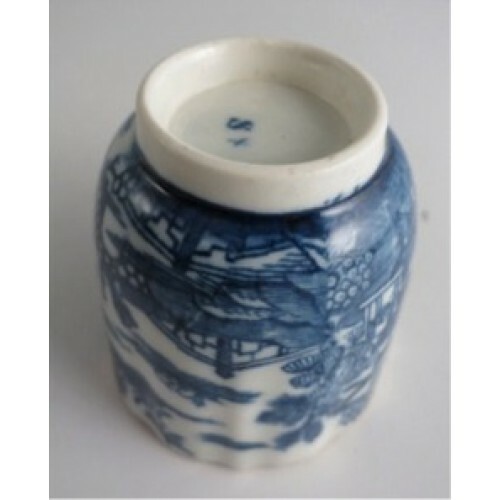 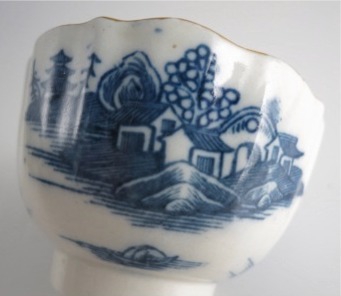 In the base of the tea bowl is a little blue and white oriental landscape scene. 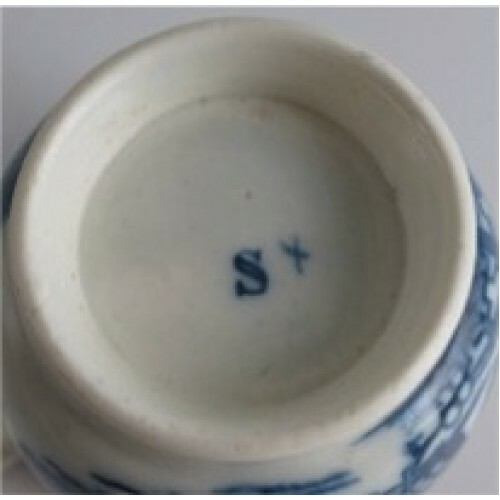 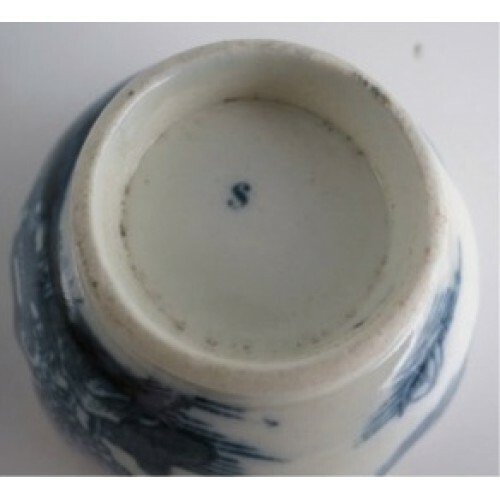 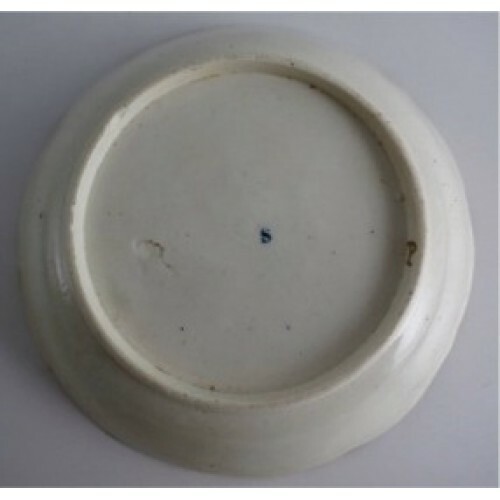 The base of the tea bowl is clearly marked with the underglaze blue 'S' mark. 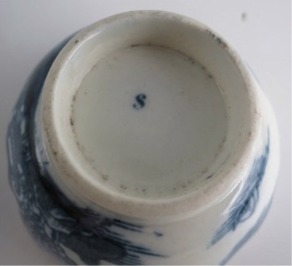 This mark was used at the Caughley factory, Shropshire, c1775-90. 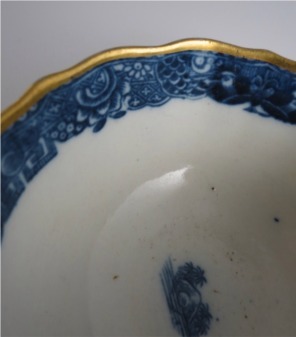 It also has a gilder's mark of '32'. 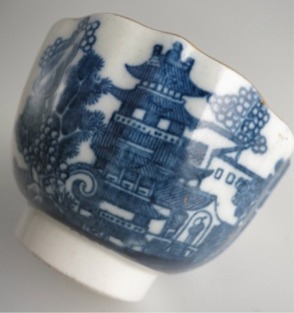 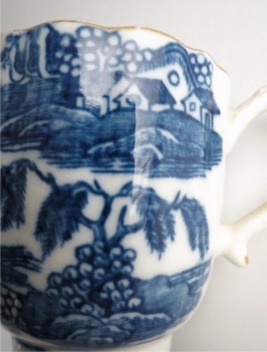 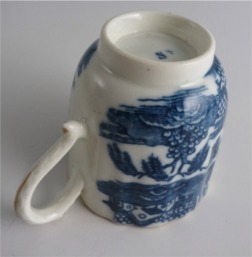 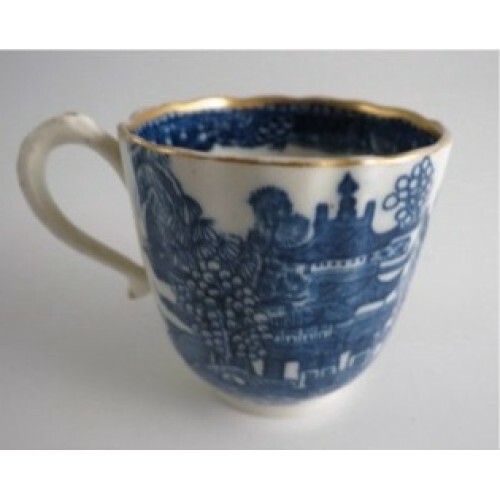 The coffee can, like the tea bowl is beautifully decorated with the same blue and white print of an oriental landscape which includes a large pagoda, etc. 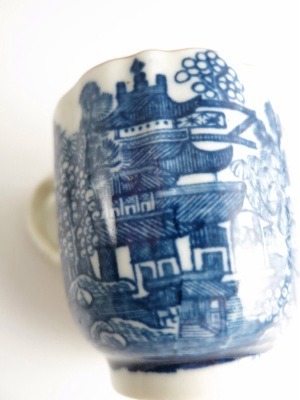 Inside the rim of the coffee can there is the same decorative band of blue decoration. 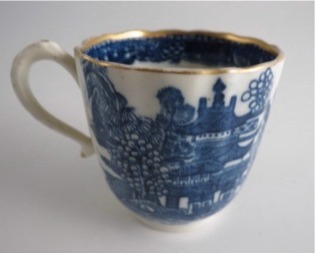 The rim of the coffee can is also gilded. 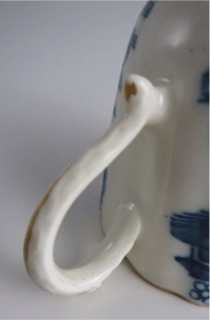 There is a charming moulded open loop handle to the coffee can, this embellished with a raised and gilded heart on the top of the handle. 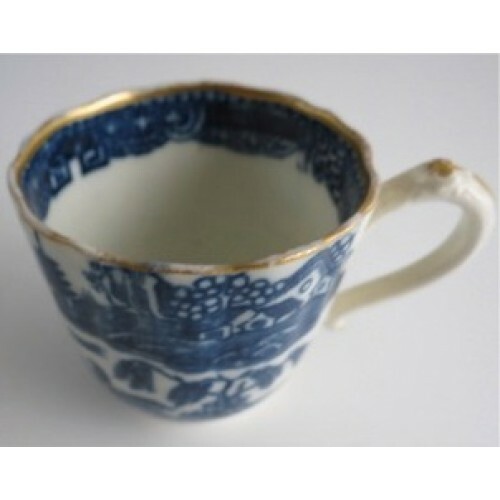 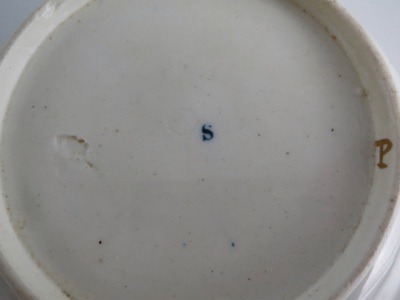 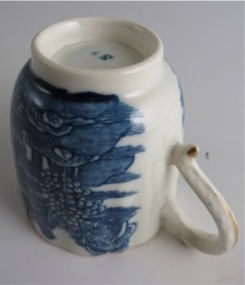 There is an underglaze blue Caughley Salopian 'Sx' mark on the base of the coffee can. 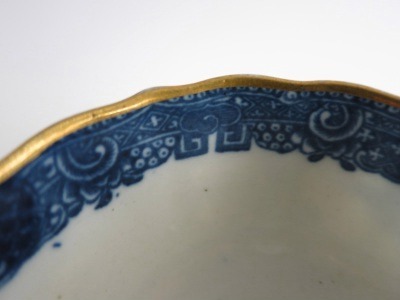 The saucer is exquisitely decorated with the same design as the tea bowl and coffee can and has the same scalloped and gilded rim. 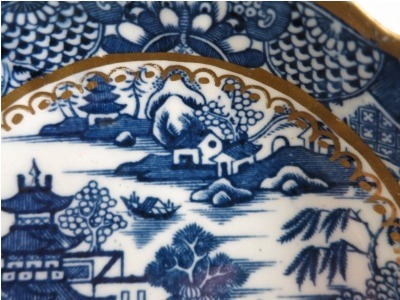 The quality of the blue and white landscape is wonderful, so very detailed and clear. 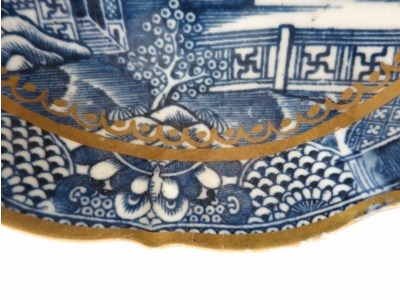 There is a gilded band to the base of the decorative border which has a gilded scalloped line and dots below it. 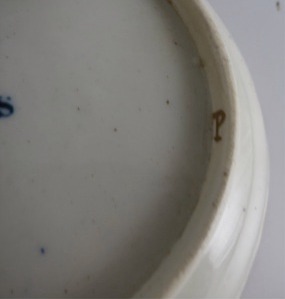 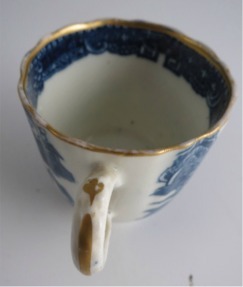 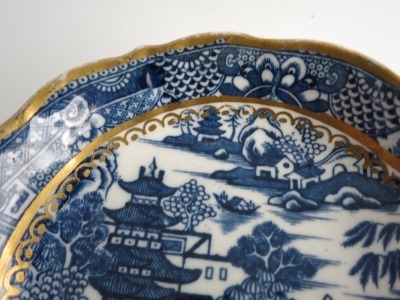 The base of the saucer is marked with the same Caughley 'S' mark with a gilder's mark 'P'. 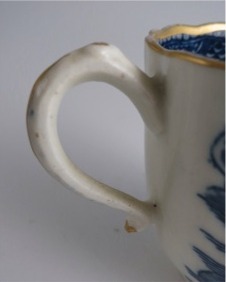 2½" (63mm) height of the coffee can. 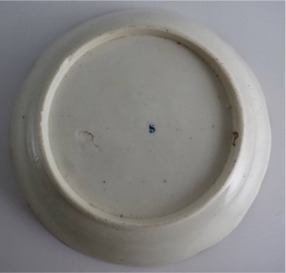 2¼ (58mm) diameter of the coffee can bowl. 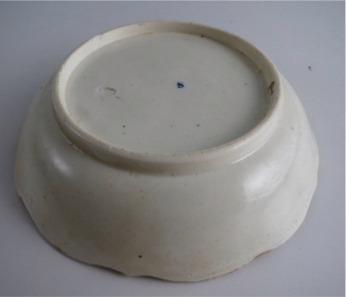 8 oz (220gms) total weight of the three pieces. 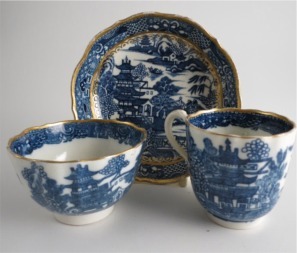 This beautiful Caughley tea bowl, coffee can and saucer is in good condition with no chips, cracks, repairs or restoration. 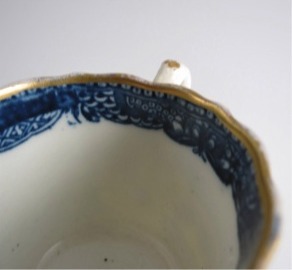 The only extremely minor imperfection is a little wear to the gilding, mostly to the rims of the items. 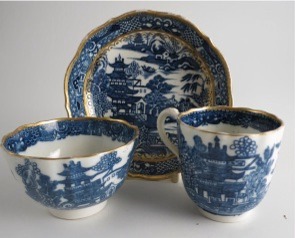 This is a charming Caughley trio dating from c1785. 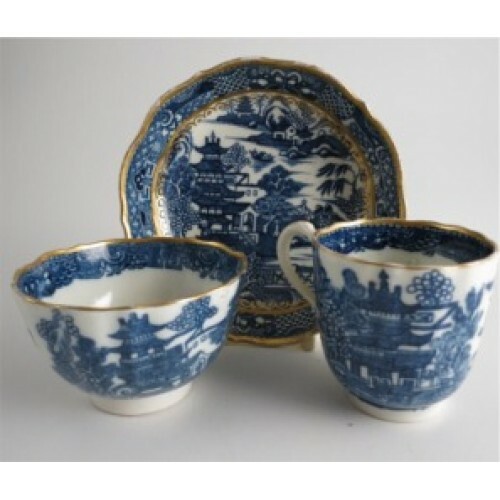 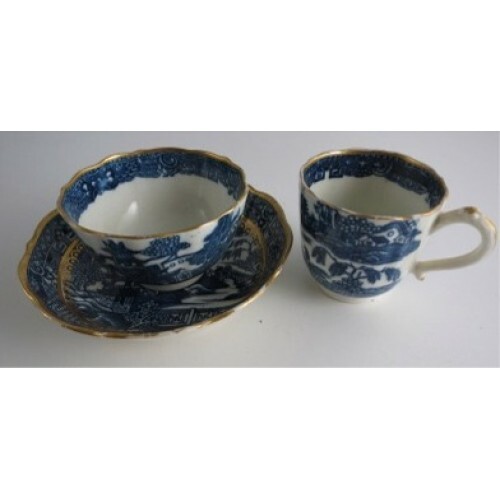 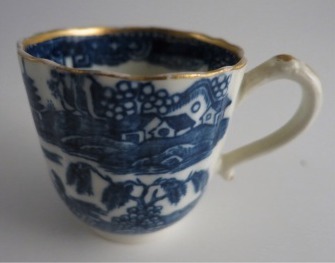 A fine addition for the collector of fine quality Caughley porcelain from the eighteenth century. 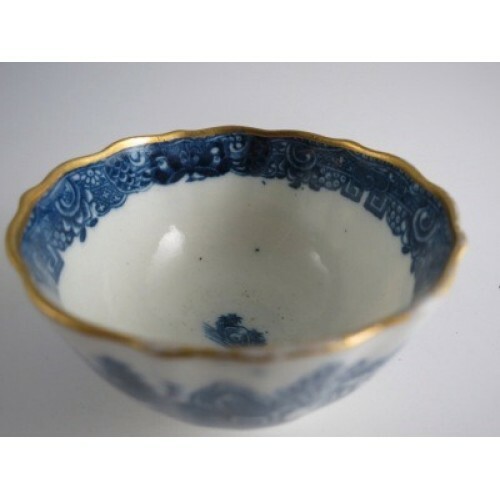 Condition (See main description for full details and pictures) This beautiful Caughley tea bowl, coffee can and saucer is in good condition with no chips, cracks, repairs or restoration. 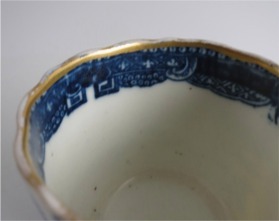 The only extremely minor imperfection is a little wear to the gilding, mostly to the rims of the items. 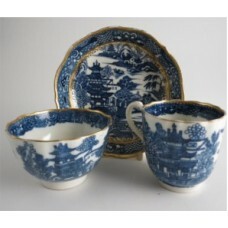 This is a charming Caughley trio dating from c1785. 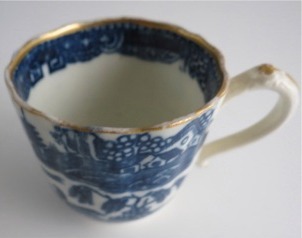 A fine addition for the collector of fine quality Caughley porcelain from the eighteenth century.